Born on September 30th, 1985, in Kanagawa Prefecture. Began playing the violin at the age of 3. Went to Toho Gakuen University until transferring to Nuremberg University of Music in 2006. She graduated at top of the class the next year. In 1997, won 1st place at the 7th Nihon Classic Music Concours National Competition Elementary school student’s section. IN 1999, held her first solo recital. 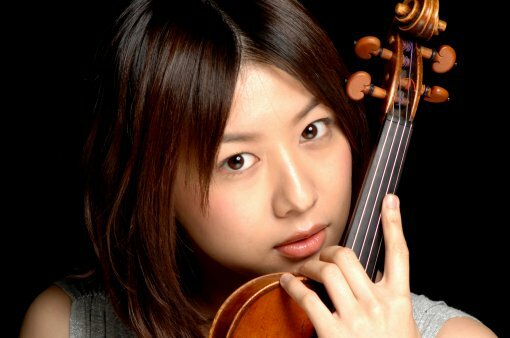 In 2001, became the youngest person to win 1st place at the 10th Nihon Mozart Music Concur Violin section. In 2004, won 1st place at the 73rd Japan Music Concours. Also received Leucadia, Washimi, and Koroyanagi awards. She has performed with NHK Symphony Orchestra, Tokyo Symphony Orchestra, Tokyo Metropolitan Symphony Orchestra, Tokyo Philharmonic Orchestra, Nuremberg University of Music Orchestra, Janacek Chamber Orchestra, Vietnam Symphony Orchestra, and various other orchestras around the world. In November 2006, released the debut album “Dolce Lina – Morzart Futatsu no Violin Sonata Hoka” from Victor Entertainment. In September 2008, released her 2nd album “Carmen” which was recorded in Berlin alongside piano maestro, Pavel Gililov. In 2008, recorded and aired Kreisler’s Violin Concerto. In July 2010, released a live album “Ravel Live” which was recorded at Kioi Hall at a recital with pianist Kazune Shimizu. In November, released an album of Ysaye’s Sonata for Solo Violin, which was picked up by the magazin “Record Geijutsu”.